This hand crafted and painted set of Matreshka dolls was created especially for Russian Treasure store. 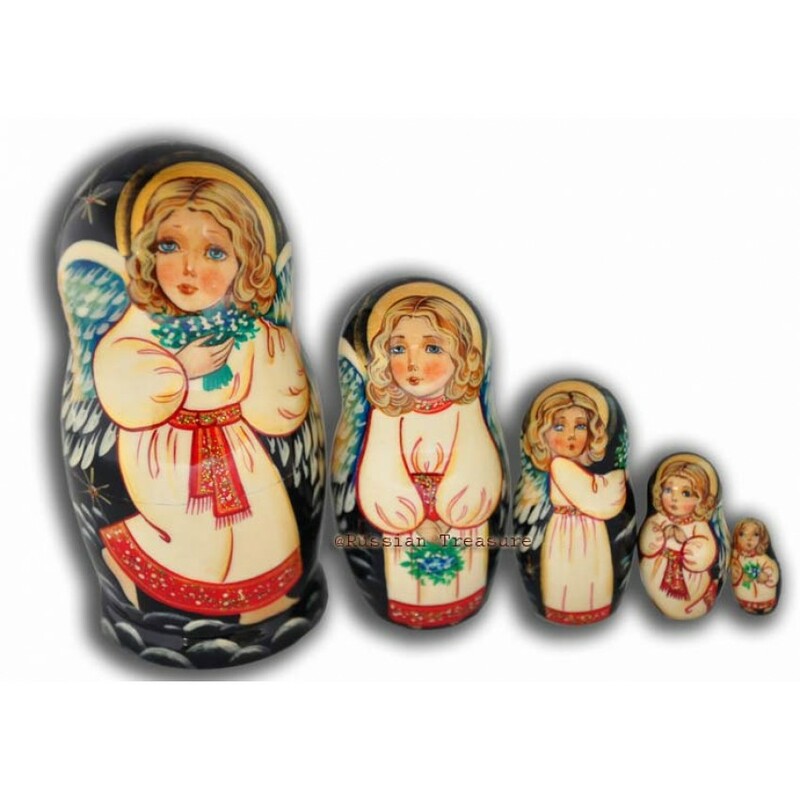 The angels, a favorite motive of Matreshka dolls’ presentation, are exquisitely embedded in the wooden figures and carry an air of holiness and spirituality. The artist has chosen a contrasting black background to emphasize the delicacy of the godly creatures. The white garments of the supernatural beings portrayed on each Matreshka doll, symbolize the purity of God, while the scarlet belt, collar and the bottom of the chemise stand for the blood of Christ, who suffered for the whole people. Each Matreshka doll features the same figure of angel, but every time in a different posture. The angel on the first Matreshka doll carries the tender blue snowdrops in his hands that beautifully set off his eyes of clear blue sky. On the second Matreshka doll the angel with the corn-golden hair holds the bouquet down with his eyes to the ground as if sorrowful of something. The gold leaf used to reproduce the divine shine of the angels’ halos gives an air of celestial serenity to each Matreshka doll, while the lavender and snow-white clouds, painted on the back of each Matreshka doll, fortify the overall impression of divinity. This set of Matreshka dolls is sure to enchant any viewer and make a fine gift for Easter, Christmas or any other religious occasion.